This first experiment is watercolor with rubbing alcohol dropped on it. I liked it so much is did some other experiments with it. 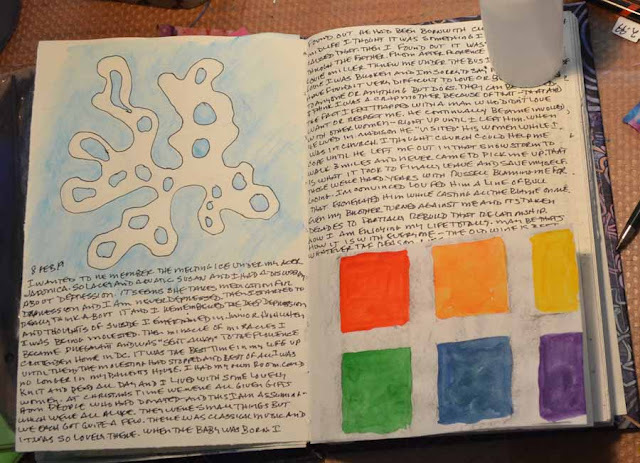 This was just a random page out of my sketchbook I liked the shape on the left and the right side has a piece of heavy weight vellum from a friend that I added color to to see how well it took watercolrs (very well). 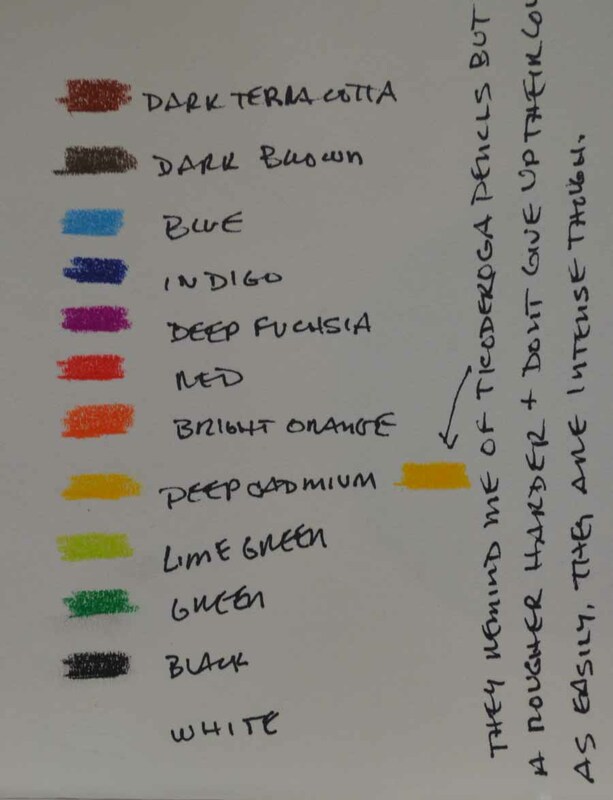 I just picked the colors and didn't notice until I was done that I had unconsciously chosen complimentary colors. Funny how the brain works. This was an experiment I wanted to do to see how well three Derwent pencil products would blend. The first is Coloursoft pencils (dry only). The red and blue blended nicely to purple. 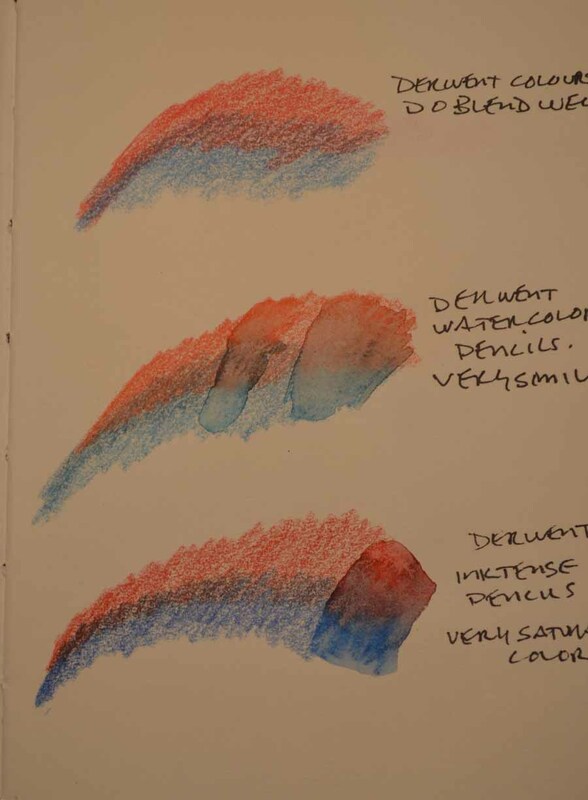 The second was Derwent water soluble pencils which also blended well dry but looked pretty anemic when wet. The last was Derwent Inktense pencils. They blended well and looked very saturated both dry and wet. Good to know in case you ever want to buy water soluble pencil or even just heavily pigmented pencils. Today my new Derwent pastel pencils arrive! Below are the 12 set of Coloursoft pencils. The yellow orange box to the right are Ticonderoga colored pencils which aren't made any more. I was purging things on my desk and in my haste I threw these out. Cleaner's remorse. Only the yellow escaped my grasp. It is where art and science intersect~experiments! Just like Leonardo and his notebooks!